Today I need to pop by the grocery store. It’s an “everyone fends for themselves” kind of night (have I ever mentioned that I live at home?) and I’m making my favorite Gwyneth Paltrow recipe. So I gotta grab some cauliflower & flat parsley! It’s 29°C/85°F and threatening to rain, so I have to run over there fast. My outfit today is definitely Alexa Chung ~inspired.~ It’s hard to wear vintage denim shorts and not feel Chung-y in them! One Teaspoon Bandits (review here) — these are their vintage denim bandits that I snagged on eBay. A problem with buying “vintage” mass produced items online is you never know exactly how the wash will look, but on eBay the seller will have a photo of the exact item, so you know what you’re getting into! 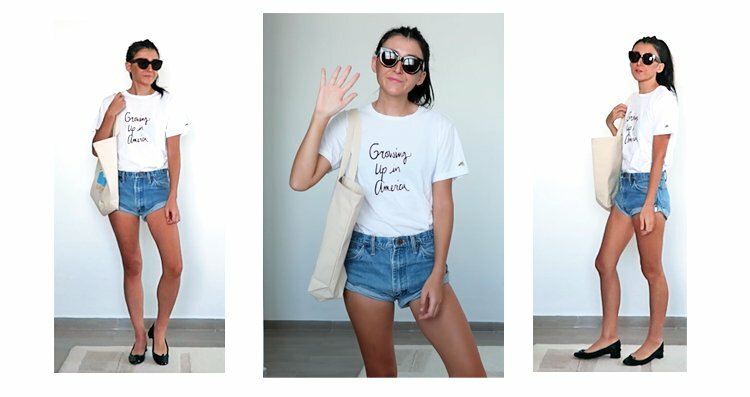 (literally) | Bella Freud “Growing Up in America” t-shirt — I have a working theory this was inspired by Rene Ricard. “Growing Up in America” was one of his poems and the cursive is so similar to his style… | Céline Caty sunglasses (review here) | Repetto Camilles (review here) — hopefully I make it there and back before it pours! | Canvas tote — for my groceries!